When visiting Madrid, many people don’t realize that just 100 miles away, deep in the heart of Old Castile, lies Ribera del Duero, one of Spain’s most prominent wine regions. Wine making along the banks of the Duero river dates back centuries, and one of Spain’s most famous wineries, Vega Sicilia, was founded there in the 1860’s. Starting in the 1980’s however, Spain experienced a boom in modern wine making, with new knowledge, techniques, and financing becoming available. Ribera del Duero benefited tremendously from these advances, and the within the last three decades the region has exploded with top quality producers focusing on red wine made from Spain’s native star grape, Tempranillo. 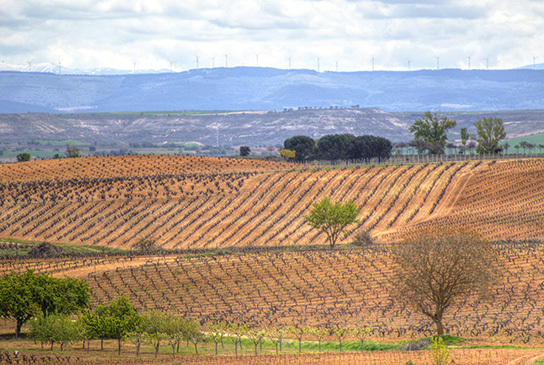 Key to region’s success is that it’s found on the highest part of Spain’s Meseta Central, with vineyards planted at nearly 3000 feet above sea level. This elevation is crucial, as the area’s warm continental climate, cut off from any maritime influence by a ring of mountains, is mitigated by cool nights where temperatures drop by up to 40 degrees F.
The combination of high altitude sunlight and vast temperature differences, means that Tempranillo can fully ripen with high levels of color and grape sugar, while maintaining acidity, freshness, and delicate aromas. This unique climate leads to powerfully structured, fruity wines, that simultaneously offer muscle and elegance. If you’d like to learn more about the current Spanish wine scene, have a listen to this radio interview I did with travel magnate Rick Steves. As a certified sommelier, I’ll be with you the entire day, taking advantage of our time together to give you a full overview of the Spanish wine industry. Subjects include Spanish wine history, other important Spanish wine regions and how they compare to Ribera del Duero, how Spanish wine makers combine Old World with New World philosophies and what effect this has on the wines, and about the revolution that’s been taking place in Spanish wine, shifting the country’s focus from quantity to quality in only a few decades. Once we arrive in Ribera del Duero, you’ll enjoy an extended visit at two of the region’s top wineries, exploring both the installations and the vineyards, as well as a tasting of two quality wines at each stop, separated by a relaxing lunch at a local restaurant. The cost of lunch is not included here, as I’ve learned that it’s more comfortable for people to be able to decide exactly what they’d like to order and how much they’d like to spend, rather than than a fixed price lunch added on to the final price. When coordinating your visit, I’ll offer several lunch alternatives to choose from.